Today Google released the new Android 7.1.1 OTA developer preview for the Nexus 5X, Nexus 6P, and Pixel C. If you are the Nexus 5X, Nexus 6P, and Pixel C users then you can enjoy this new Android 7.1 Nougat on your phone. The new update comes with some new features and bug fixes. You can enjoy all the new features that you saw on the Google Pixel phone with this new update. The update is packed with new launcher shortcuts, round icons, and image keyboard support. To apply this update on your phone all you need an OTA zip file and flash the same on your phone with the help of the Recovery. Below is the link of the Android 7.1.1 OTA from where you can download and save the OTA zip file on your phone. 1. Download and save the OTA zip file on your phone from above mention link. Make sure you save the zip file on your internal storage and don’t put it inside any folder. 2. Once the zip file is saved on your phone, boot your device in recovery mode. 3. From recovery main menu Select the “Apply update” or “Apply update from phone storage” option. 4. 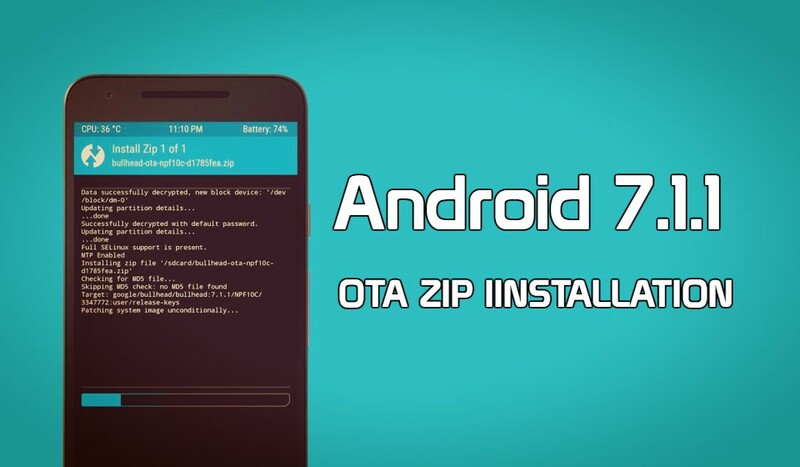 Now locate the OTA zip file that you saved in Step 1 and install it. 5. Once the installation process is complete, go back and Reboot System. 1. Download and save the OTA zip file on your phone from above mention link. Make sure you save the zip file on your internal storage. 2. Boot your phone in TWRP recovery mode. 3. Select the Install option and locate the OTA zip file. 4. After selecting the .zip file, do Swipe to Confirm Flash on the bottom of the screen to start the flashing process. That’s all. The new Android 7.1.1 OTA is installed on your phone, and the first boot will take some time near about 5 to 6 minutes so be patient.